2 tickets to all Concerts. 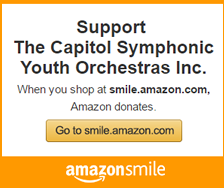 (All TCSYO musicians are required to sell three (3) adult tickets for each concert). 50% tuition deposit ($330.00) is due on acceptance, July 1, 2019. Tuition balance ($330.00) is due by September 1, 2019. *Families with more than one musician participating in TCSYO will qualify for a 10% tuition discount. There is no on-line payment available for this family discount. Please submit a check via USPS to the below address. *Partial tuition assistance and scholarships are available for qualified families. By clicking on the "PAY NOW" button above you will be directed to the payment page. You are not required to have a Pay Pal account to use this method of payment. The application fee of $45.00 is non-refundable. 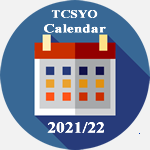 If a written request is submitted by Parent/Guardian to TCSYO before September 1, 2019 the tuition fee will be refunded fully; minus the $45.00 application fee. No refund will be made after that date without valid medical documentation.